Two years ago I was part of a group of garden bloggers invited to visit Little Prince of Oregon Nursery. I wrote a lengthy post about that visit (here) with a lot of photos. I missed the repeat in 2016, due to illness, but last Saturday I had the pleasure of visiting again. Hopefully most of you have seen their plants in your local nurseries, they ship all over the country. Here in the PNW we're spoiled, we can find them almost everywhere — even Fred Meyer — I regularly tuck a couple of Sempervivum or Sedum in with my grocery shopping. Before we get started I'm including a screen shot of their website as well as a link. It's a great website for learning even if you can't shop it. Now to visit! This tall structure is new and houses their offices. We were treated to lunch on the second floor, and no, I didn't sneak up to the top floor to walk out on that balcony. But I wish I had. After an informational talk with Mark Leichty, our host for the day, we were set free to wander through the greenhouses and shop. The nursery is wholesale so not normally open to the public...we had to make the most of this opportunity! Naturally one of the first greenhouses I need to visit was the Agave house. Even tiny Agave Ferdinand-regis have a great look. I think these are the left-overs. Jovibarba sobolifera, which look a lot like Sempervivum but are not. Some people call them "rollers"...because the babies detach from the mother plant and roll off to root elsewhere. Seriously. Mixed Sedum squares, great for covering big areas when you want a ready-made mix. We had 70 greenhouses to wander in and out of, that's a lot of plants! Most of them are unheated, Mark had told us that LPO is a "cold grower" meaning they don't heat their greenhouses much, some not at all, and some to 34 degrees. This produces plants that are fully hardened off, and ready to plant out. I could have easily made one pass just for photography an then another for shopping. As it was we were there over 3 hours, so I did my best to squeeze them both together. I'm afraid shopping took precedence. Finally the Sempervivum, how about a couple close-ups? I didn't get names, not out of any disrespect for these fabulous plants, but because I just can't manage to remember them, so I give myself a pass. Not sure if this fluffy creature is a Euphorbia or a Sedum. The weather that day was predicted intermittent showers and sun. I hadn't read anything about hail, yet here it was, insane, violent hail. Most of our group was done shopping and back inside the offices. Heather, Amy and I were the stragglers, trapped in a greenhouse until this stopped. You can not imagine how loud it was. Just moments later the sun was back out as I loaded up my car. My haul, plus Alison's (she rode down with me)...note the hail in the empty spots. Now to share what I bought. Here's a mixed tray of Sempervivum, Sedum and a couple pots of Nassella tenuissima, Mexican Feather Grass, because even though others experience this plant seeding around I do not. This tray has several 4" pots and other larger plants from their "FIT FOR A KING" line: "Rare and unusual plants for the intrepid gardener..." The big one on the upper left is Corokia virgata 'Sunsplash', a plant I've always thought a little jarring until I saw it in a friend's garden (online), I think it was Kris who's growing it so well. I am thrilled to make it mine. Next up, the Agaves. This beauty was not labeled and there were only a couple of them. I consulted my Agave guru (Gerhard) and while acknowledging that small Agaves are difficult to ID, he then said he thought it might be "some form of A. titanota — not the “real” titanota as defined by Howard Gentry — but the ‘Felipe Otero’ variation"...whatever it is, it's gorgeous. Another from the "grab-bag" corner. I thought it might be Agave americana var. protoamericana 'Silver Surfer' but comparing it to the one I have in the ground I am not so sure. I am going to bet on it being hardy here though. For good measure a Woodwardia orientalis, and the green carpet is Scleranthus uniflorus, which I am trying again (code for...killed it already). These two ferns I managed to pick up without a label and without taking a photo of their sign. Duh. Bad form. I think they're Athyrium filix-femina 'some something'...but don't bank on it. I grabbed a Thalictrum ichangense 'Evening Star' — because that foliage! (never mind that I've also killed it before). Abutilon hybrid 'Nuabyell' — a dwarf and fairly hardy Abutilon, yellow blooming. I am still (barely) holding out hope the one I've grown for a couple of years now is gonna come back, but if not, this one is insurance. Finally I did pick up a couple of the Delosperma 'Jewel of Desert Topaz'. I don't have a single ice plant in my garden and with those happy orange flowers it just seamed like I should take the plunge. Of course they've been closed in protest ever since. If you're reading this and wish you too could visit LPO — and you happen to be in the Portland area — I've got good news! There's an upcoming Hardy Plant Society of Oregon "After Hours" event at Little Prince on Thursday, June 15. It's open to any HPSO member, or anyone looking to join. Details to come at on the HPSO website and Instagram. Weather Diary, April 10: Hi 55, Low 41/ Precip .19"
Great purchases, and I'm glad you got some Delosperma. I have several, and 'Firespinner' is blooming now. I've heard that 'Firespinner' is a bit of a dud, as far as the flower production. What's your experience? Even though you combined both shopping and photography, you got some great shots. That one of the grasses is magical, there's something very soothing about it. Do you want more Nasella? I can bring some for the swap, if you want. Thanks so much for driving and being company on the way down. Yes please! I would love a couple. And thank you for riding with me! I would have grabbed that Thalictrum as well. So pretty I went online and looked it up. Would work in my zone, hmmmm. I once called my husband to listen to the hail we were having while he was at work 5 miles away with no hail. I was in the basement and he could hear the hail hitting the roof via the phone. I think that's the year we had to have the roof replaced because of hail damage. Wow, roof damage from hail, that sounds like a garden shredder for sure. I do hope you try the Thalictrum. I doubt its really all that difficult to grow, both of my other, bad, experiences were primarily user error. Thanks for the tour of this fabulous operation! I always smile when seeing their plants at Fred Meyer or elsewhere. Thanks also for the heads up about the June 15th after hours event. I'd love to see this operation in person someday! Great haul! Hope you can make it down in June, school will be out by then right? That must have been fun. As always you chose some great plants. I've killed that Scleranthus three times now, so I don't have to grow it anymore. The pressure is off! Wow, great place, lucky you. You would simply go mad at all the Sempervivum. Your so right about the office making a great home. So much nicer than a lot of the lame things builders are putting up these days. I'm glad to see that you're hard at work identifying replacements for the casualties of your horrendous winter! I hope the Corokia does well for you - it seems like your kind of plant. One of mine is doing exceptionally well, while a second is treading water. I "need" to try some of those new Delosperma hybrids. And I'm glad to see that you realize it is hard work! Ha, okay not really. And yes, you do! How nice of LP to invite the bloggers over-and to let you buy stuff ! I too love M Feather Grass and found the seeding around to be insignificant in my garden. Very easy to pull up, and sparse for me. I especially like your fern selection ! It is so easy to pull up, you're right. Although I have tried to relocate a couple of self-seeders and that's a no-go. You took a lot more photos than I did. I was really in shopping mode. That block of nasella! I loved it. I need to clean the dead bits out of mine so they look more like that, though I don't mind the dead bits in that grass as much as I do others. The fluffy creature looks like some variety of Sedum fosterianum, like the one I have with the amazing winter color. Thanks for the possible ID, looking forward to your post - to see what caught your eye and what you bought. I could move right into that lovely office building. Don't they need an on-site grounds keeper? I see LPO products in all the Seattle nurseries. I'll be looking at them with greater appreciation from now on. The Woodwordia is grand. I think mine came through this Winter, fingers crossed. Yay! My Woodwardia that's in the ground seems to have a "swelling bump" in the middle. I'm hopeful that a frond will be emerging soon, if we ever actually warm up. You had HAIL??? Wow - that must have been an experience... I know the sound well - it is positively deafening. And somewhat scary when you happen to be in a glass house. I'm encouraged by the fact that not even you can remember the names of all those Semps and Sedums - it makes me feel better. I have used 'Sunsplash' quite a few times - it looks great paired with Melianthus. When I was there, I was excited to see that they also grow the smaller version 'Tutti Frutti'. Maybe - just maybe - I could shoehorn that one in somewhere...? Violent hail, it was crazy. I can't imagine standing under glass while that hit...yikes! And yes, I think you definitely have to try. I'll take a look at their website--thanks! Gosh, look at all those succulents! I want them all! Usually being stuck in a greenhouse full of healthy plants would be pleasurable, but I can only imagine the sound and agitation of hail pounding down on it. You gathered a nice stash of new plants! My friends and I were shouting at each other to be heard! The bright greenhouse was much sunnier than my car, no doubt. Luckily I noticed some open yesterday. I was tempted to buy some Delosperma this weekend. 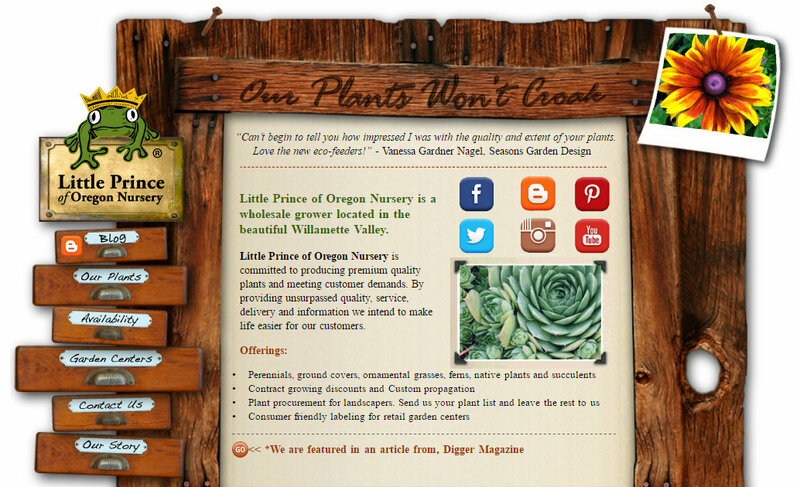 Looks like another great PNW nursery. Great write up! That was a fun trip and it looks like an even funner haul for you, Loree! Sweet. I should just shop with you next time, you always pick the BESTUS plants EVER.